I totally missed the requirement that the application be sponsored by a current TMA member. We have a Athens Fish & Game Club meeting coming up and I will shepherd this through. It still gets mailed to Riley? When the application is printed the mail-to address will show as it is on the last page. As a side note, Out of respect for Riley, I edited his original post, rather than delete it, about a month ago. the application is on the top of that page. Kees, please mail it to me. Right, I saw the address was in MN so that is why I asked. I'll send it to you when I have it filled out. 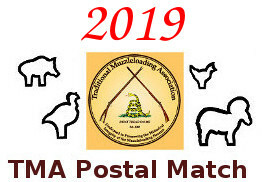 Speaking of the application, I just noticed that the word "Muzzleloading" in the association name is spelled wrong - the "A" and "O" are reversed so it is "MUZZLELAODING". It being a .pdf file, I don't know if that can be easily fixed. Thanks for pointing that out, I'll get'rfixed.